The alarm server forwards the alarms via text messages (SDM, SDS) to the radio subscriber. This mechanism is compatible with both DMR and Tetra provided that the radios are configured with the appropriate header compression. 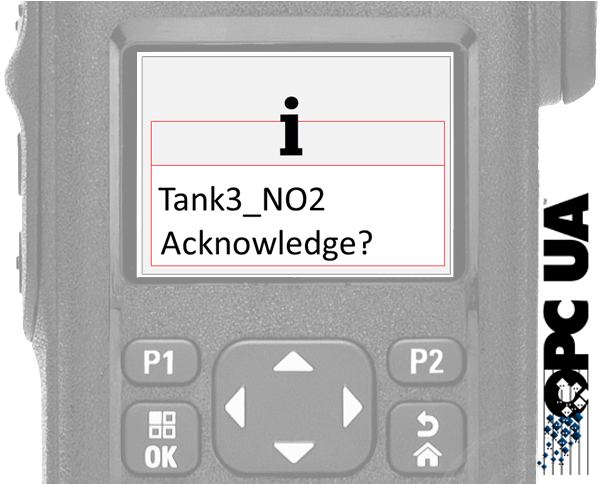 Alarms can be configured to be affected to GroupCalls and automatically dispatch to a single operator or group. The configuration is accessible from a web-panel or via the OPC Server configuration panel. Active alarms should be followed by operators to maintain nominal operations. 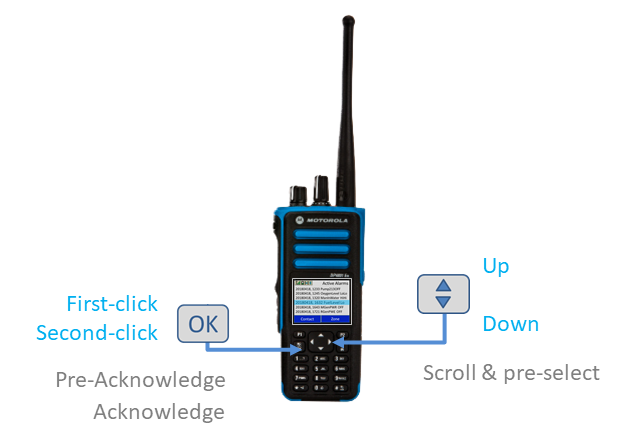 The alarm acknowledgment function is embeded into the portable radio. Scroll through the active alarm-list and acknowledge an alarm. The OperatorID who has acknowledged the alarm is forwarded to the OPCAlarm Server and shared with the control room. The full alarm-list is streamed to the portable radios. Alarm Dispatcher does not only sends the latest alarm triggered, it allows for scrolling the full active alarm list directly from the radio. This feature is interesting in the case of multiple alarms. It distinguishes ACTIVE alarms from INACTIVE alarms which once were in an active state but no-longer require the operators assistance. The Alarm Severity levels are represented on the radio by use of a colour code affecting both the Radio LED and the Alarm Popups on the radio LCD display. According to OPC, Alarm Severity levels are contained between 1-999. The severity mapping table is configurable to distinguish critical safety alarms from warnings and simple events such a coffee break! As part of our customer loyalty programme, Datamatik would like to promote its AlarmDispatch feature by providing a free firmware upgrade of the radio subscribers. If your Motorola radio was purchased via our Datamatik's distribution network, the AlarmDispatchforRadio firmware upgrade is for free. Please get in contact with your sales channel to learn more about the remaining cost related to the AlarmDispatch OPCAlarmClient software license. For Motorola Radios bought outside the Datamatik distribution network, a 45 euros (excluded VAT.) license per subscriber is required to unlock the alarm acknowledgment feature. Are you using Mindsphere @Siemens to digitalize your factory? Alarm Dispatch is Mindsphere ready using the OPCUA drivers. Tell us more about your configuration? Are you using a motorola infrastructure? 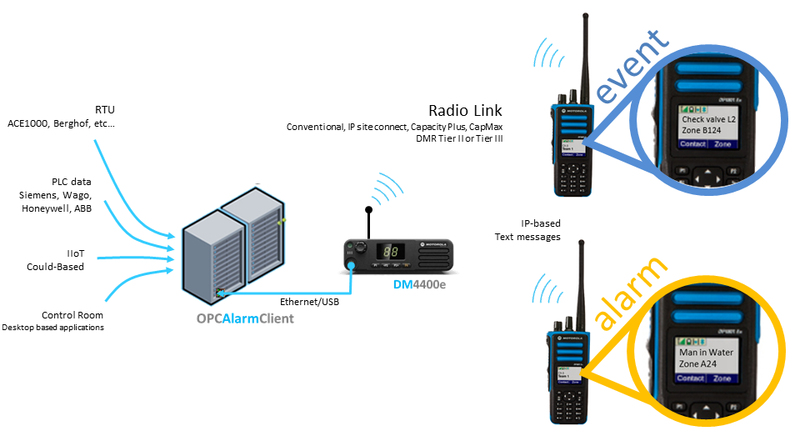 Do you want to mix DMR radios from different branks? For which infrastructure? (leave blank when irrelevant). Where do you retrieve your alarms from? What type of radios are you using? How many alarms would you like to transfer to your radio fleet? How would you like to configure your alarm dispatch configuration file? from your existing alarm system? Would you like to acknowledge your alarms from the portable radios? Thank you! We will get back to you shortly with a quote for your Alarm Dispatcher.